A pet parent’s dream is to always stay connected to their furry friend. They do not want this connection to break when they go to work, on a vacation, or even out to just grab a bite. Besides, there is always a nagging feeling when owners leave their pets behind. In the 21st century, owners are unwilling to compromise on the health and well-being of their fur babies and rightly so. These animals are not only members of the family, but sources of happiness, therapy, companionship, and so much more. According to recent studies, 1 in 4 dogs experiences bouts of depression due to the stress they undergo when left alone. Therefore, PetCube took the initiative to become the forerunners of human to pet communication. PetCube's aim is to completely re-imagine the concept of pet care by creating an entire industry dedicated to our furry companions. 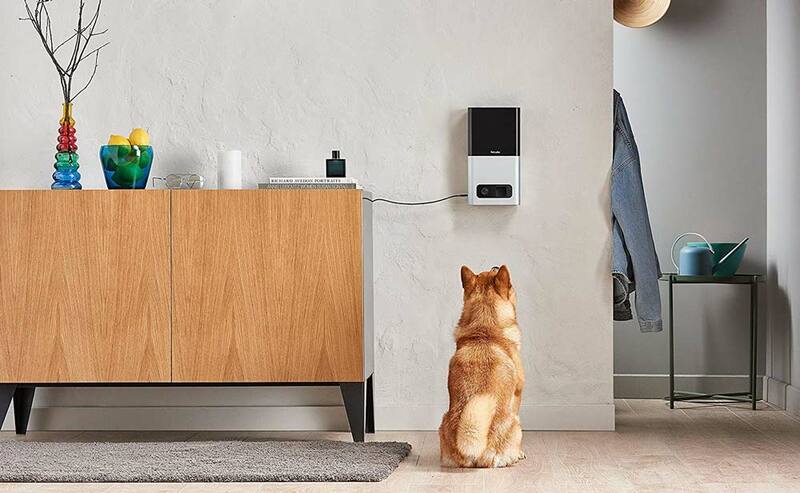 That’s why they introduced PetCube Play, PetCube Bites, PetCube Care, and PetCube Mount to satiate the demands of concerned pet owners. Their innovative thinking has thus allowed for a dynamic shift in how we interact with our pets. Moreover, their carefully manufactured products cater to a huge demographic via the theory of virtual reality and relationship strengthening. Spark of creation ignited in 2012, in Ukraine. Specifically, when their Chief Technology Officer, Alex Neskin’s Chihuahua, Rocky, started stirring up trouble for his human friend. Faced by the enormous shadow of separation anxiety, Rocky acted very badly. He scratched and barked relentlessly to the point that neighbors felt the urge to call the police or animal control. This resulted in the prototype creation of PetCube Products. Alex constructed an Arduino-based robot with a web camera and remote-control laser pointer. This allowed him to distract his dog through a simple web interface. 2013 came with Andrey Klen and Yaroslav Azhnyuk, Alex’s fellow colleagues at the digital agency, launching PetCube on Kickstarter. The enterprise was a monumental success and surpassed its initial $100,000 goal with $251,000. Hence, earning them the title of the most successful crowdfunded pet product of its time, ending with $500,000. In October 2014, their products became commercially available. Since then, their products have had mechanical and electrical engineering reviews. They’ve also conducted concept testing and thorough market research. Moreover, they’ve complimented it all with qualitative user research, carried out user field research and created focus groups. Where Can Your Buy PetCube Cameras? Making sure that their foundation was sound and solid, the prototypes were refined, constructed repeatedly and finally validated. With highly efficient production runs and state-of-the-art quality control, their products were a predictable hit with the public. Still growing strong, this high-tech pet software and hardware designing company, has raised $14 million, selling over 100,000 cameras in 2017 alone and selling their products in over 18 countries, with 5000 retail locations. Their products are available at Best Buy, Amazon, Chewy, Petco, Macy’s, Bed Bath and Beyond, and SELFRIDGES&CO. PetCube offers free shipping over $50, a 30-day trial, a year-long warranty, and a 45-day, money-back guarantee. Through this, they continue establishing customer value and strong customer relationships. Furthermore, they go the extra mile with their pet-proof cameras to capture a pet’s silly and adorable moments. At the same time, it helps humans protect their canine companions remotely. What Is the Purpose of PetCube? PetCube began an endeavor to eliminate pet alienation at home and boost social and emotional interactions with our beloved friends. Their gizmos allow you to have one on one conversations with your pet. In addition, it allows to hear them as well. In the busy makeup of our everyday lives, we all need moments of therapeutic calm. Something that exists especially in the comfort of our pets. PetCube owns merchandise that brings to the table mutual benefits for pets and owners. This bilateral link allows for a two-way reciprocation of reassurance and love. Moreover, PetCube has an outstanding support system. It includes seed injectors, financiers, pet brands, and also celebrities like Emma Watson alongside hundreds of thousands of other consumers. Their brand image has reached insurmountable heights in a short span of six years. It seems that they aren’t slowing down any time soon and with each product, they continue to improve. They study animal as well as consumer behaviors and deliver need-oriented goods to satisfy their customers. Unlocking the PetCube world and all the glorious amenities it has to offer is broken down into the simplest steps imaginable. You can even sign up for PetCube Care which includes 24/7 coverage, 2-year device warranty, recordings made upon being stimulated by your pet. Any sounds or motion are transmitted back to a cloud recording video service that archives your fond memories for up to 10 months of footage history. You can replay videos and be notified in less than 15 seconds. PetCube Care exclusively offers a membership that provides multi-day non-stop video cloud recording, complemented by VIP Club access, care packs, linkages with premium pet brands, discounts and sign-ups with pet-oriented services. This includes veterinarian insurance, gadgets, and rewarding money-saving options. It even adds on a smart alert feature that enlists human recognition, barking, and pet recognition. The free smartphone application is highly user-friendly and places at your disposal a multitude of programs to keep you occupied. It opens a virtual pet reality of adventures and discoveries, live streaming, chatting, interacting with your pet, as well as the ability to browse and follow other pets and pet owners. This way you can share pictures and videos from your own personal life and gain access to pet shelters to make further additions to your canine household. This pet theme application gives you the tools to create your own fan base. You can do so, via linking your Instagram, interacting with thousands of other users and hosting live sessions. All you need to do is sign up with your Facebook account and phone number or email address. By doing so, you become part of the PetCube Community, gaining a whole new family. This family includes a 24/7 support line of customer service. With a toll-free US line, this company makes sure that its consumers always have a shoulder to lean on. To notify viewers, the camera picks up on and responds to sound and motion alerts. Also, all this gets backed-up to video cloud recording by PetCube Care. Adding a fun element, they’ve included a certified pet safe, in-built laser toy that either the user can control or leave it to function on its own on auto-play mode. This laser works in complete sync with your finger movements, triggering immense mental and physical simulation for your pets. For hyperactive pets, it is a great way to expend their extra energy. First, addressing the various benefits of these real-time recorders include talking about the first PetCube Camera, released in 2013. This 4*4 aluminum encased device; with a wide-angle camera, speakers and microphone, laser pointer and a mobile app that streams 720 HD videos. 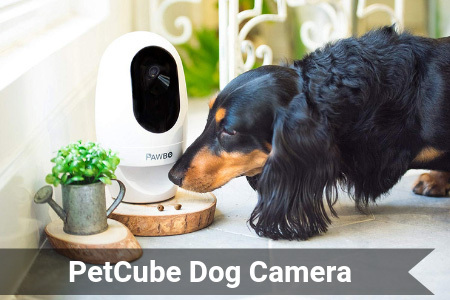 They can come with Anti Chew Cord Covers that keep PetCube Cameras safe from dogs nibbling at them out of habit. 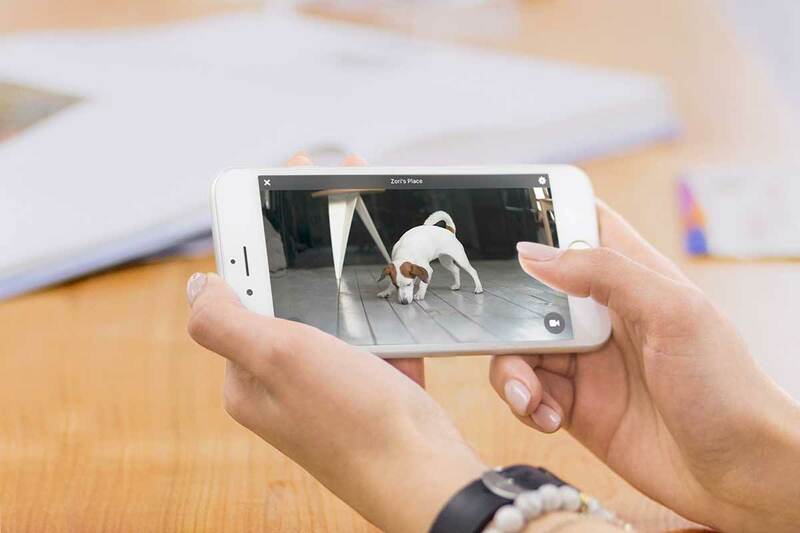 PetCube Play is a WiFi and Bluetooth sustained 1080 HD pet camera. It only takes 30 seconds to set up. Moreover, it allows you to observe, talk to and interact with your pet through a two-way audio function. All of this is possible with just a swipe of your finger. The indoor camera is compatible with iOS as well as Android devices. Thus, one can easily hook it up with their smartphone by syncing. It is offered in Matte Silver, Carbon Black, and Rose Gold. Generally, it comes with a 9ft long power cord. Thereby, giving more flexibility in camera placement especially if the electrical power outlet is far away. It ideally blends in right at home with its lustrous and compact 3*3*3-inch design (58% reduced from the original). The device is accompanied by a rubber, nonslip bottom, and a tripod stand to augment flexibility. Whether it’s a flat surface or mount, it’ll fit perfectly. The 138-degree wide-angle view is supplemented by a 3* digital zoom capacity and night vision that works in both low light and no light conditions to provide crystal clear imagery. You can even take selfies of your pet either live or from earlier feeds. The camera automatically filters out unnecessary background noise disturbances and always delivers high-quality sound. For moments when you want peace, you can choose the “Do Not Disturb” mode. To get the full effect, you can procure the PetCube Play Mount , a separately sold accessory that is an adjustable manipulator for your camera. After further observations, PetCube came forth with PetCube Bites which is an all-inclusive, HD pet camera. This device is also a treat dispensing tool. With its high durability and practical use, it possesses the capacity to hold a two-pound container, storing up to 100 treats. This large quantity vessel is very helpful for homes that have more than one or a larger breed of pets. Furthermore, this becomes an instrument to meet the feeding requirements of your pet. It allows you to condition them as well as reinforce their good behavior. Finally, you can satiate their stamina by launching food up to six feet of distance, with options such as short, medium or long distance. Syncing it up with Amazon Alexa permits you to enable playtime. You can even schedule or pre-schedule personalized messages to be delivered automatically whilst feeding, to create an association between you and your pet. The ultimate blessing in disguise is that this device acts as an intermediary medium that allows you to train your dog. It perfectly encapsulates the bonding ritual by granting the user the ability to deliver commands, reprimands, rewards. These reinforcing positive techniques provide guidance for impressionable puppies, comfort for anxiety-ridden dogs, and a tangible control mechanism. The treat launcher operates quietly so as not to startle your pet. A major pro of PetCube Cameras is that they allow us to peek into our pet’s lives. These devices help us to pick up on non-verbal cues that may be signals of distress or ill health. Generally, an undetected disease contraction is a pet owner’s nightmare. Also, the sickly behaviors of pets may become apparent when owners aren’t home. Hence, PetCube lets us see if our pets are hiding, pacing, or licking body parts too long. We can also observe if our fur baby shows signs of lethargy, nausea or changes their mannerisms, in any way at all. Subsequently, this is an excellent training and supervising tool—especially for people with elderly pets, babies, pregnant animals, or animals with pre-disposed conditions. It also allows you to keep them safe and even teach them not to defecate in the wrong place. PetCube Bites is easy to use even for the busiest of people. One simply needs to open the detachable container to load up the treats and pop it into the dishwasher for cleaning. It is entirely compatible with a vast number of pet-treat brands. Furthermore, it comes with a complimentary sample of Wellness treats with the first order. They’ve co-partnered with the Amazon Dash Replenishment Service, arming you with a hassle-free lifestyle. Through the built-in sensor and your phone app, you can choose for automatic treat refills. It has a lock built in to keep the smell at bay and preventing your pet from nibbling away at the treats. Get allied with first-class brands like Wellness, Greenies, Nutro, and IAMS, etc. e absence of WiFi renders all PetCube products useless. It’s an extravagant home device to bring into a house seeing as it demands high data usage for smartphones at around 2–3 GB per month. Second, in the absence of PetCube Care, the Care Awake/Activity Capture restricts down to ten seconds, and contrary to what PetCube advertises, only two days of recordings are accessible. This contrasts with their promise of four hours of recording. You can only sign up one PetCube per account. Moreover, a subscription is necessary for each PetCube separately. Also, the video clips that are recorded for the motion are saved in arbitrary 6–12s clips with obvious gaps. This Cloud Service is pretty taxing on your wallet, but at the same time indispensable for full functionality. PetCube incorporating lasers has also carried along with it a stigma-ridden reputation, as lasers are a controversial subject. 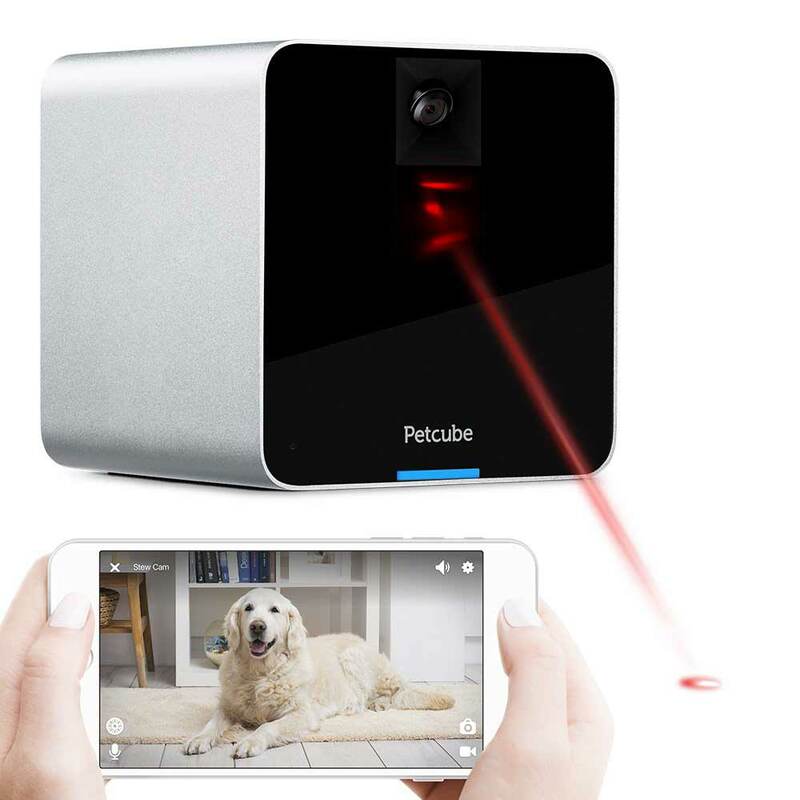 Apart from reports of lagging laser movements in PetCube reviews, pets may become obsessed with the laser and lack of fulfillment may lead to negative behavior or stress-induced reactions. The laser itself has low visibility during the daytime, which is the time that people would want to play with their pets. A countermeasure would be to place the laser in a dark room. PetCube Bites launching food can also lead to detrimental results if the food lodges into the pet’s eyes or throat. There comes with the PetCube Care Community a possible security threat. This media platform allows your house and pet to become vulnerable by distributing a clear blueprint and highlighting the times when an owner is not at home. This makes this a perfect application for robbers to want to hack into. Furthermore, the return and replacement policy require shipping the old product which is an annoyance for customers. Since it is always plugged in that means it doesn’t have a battery option and realistically you can’t place it wherever you want to. The camera is not waterproof. Apart from iPhone and Android, it is not compatible with any other, which eliminates a wide demographic of pet owners. What’s more, is that one must keep their phone update-to-date or else PetCube will not operate. It only works through a mobile application and does not function on laptops or computers. During the set-up of a PetCube, most people feel flustered. Mostly because after plugging it in, you must be pressing and holding down the button at the back; not the front, which is quite a confusing feat to accomplish. Initially, some pets may need an adjustment period to accept PetCube products. Unlike Furbo, it does not possess a dog-friendly lighting system. Biologically dogs are partially color blind, as such, they can only see blue or yellow. Furbo uses blinking lights to grab the dog’s attention. However, PetCube has no such feature. This is probably why often pets find it difficult to build a rapport with the device. Also, they are not even aware that it is functioning. Dogs will not even notice their owners wanting to play because they won’t register the device. 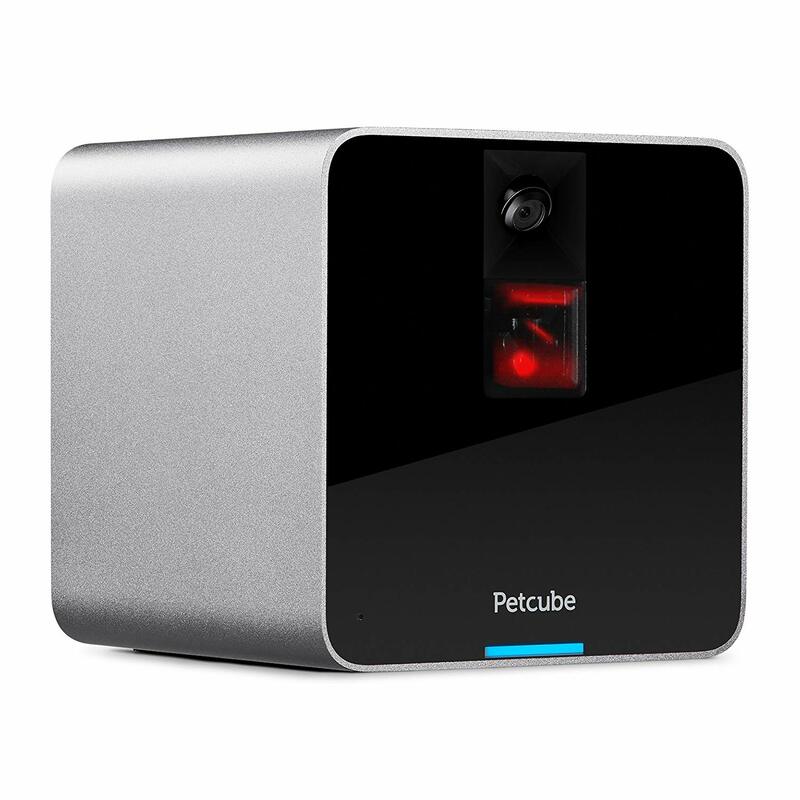 All in all, we hope that this PetCube review will help you in picking what you deem suitable for your pet. 0.0.2 Where Can Your Buy PetCube Cameras? 0.0.3 What Is the Purpose of PetCube?